Here is the reason why we need to stop striving for work life balance. At the minimum, most of us work because we want to support people around us like friend and families. The most ideal part is where we able to do the work that we like and have passion on it. Even though you do not happy with the job, working on it still become part of your life and let you contribute to the society. When you separate life and work, you will figure out that success in one aspect often support another. Example, if you want to have greater achievement in your work, then you have to be start from bottom and always perform at high level every time. It may be hard to always perform at top level but this is just training for your next greater achievement. We all always predict what will happen tomorrow and what should we do for tomorrow. This is not helpful at all and we should do is think of solution that can change from day-to-day. You may have a good day, normal one or bad day. This is normal where we are changing every day and this variation is normal for anyone. It is more useful to think life as an always changing from day-to-day or year-to-year, rather than think as a high-risk enterprise where thing could go wrong with just one mistake. The things is you are human and you are cannot score 10 out of 10 in your life. You may have to stay in office until late night and have your dinner at car or just take a day off to accompany your parent that come to town where there is nothing wrong for both choices. If you just thinking to have work-life balance like other successful entrepreneur, then you better change it quickly where you will just get your job done and hard to have greater achievement in your life. There is time where you need to devote more time on your work and less time for yourself. This is just part of your life where the chance for you to success is arrive and you need to devote more time to make use of that chance to let yourself to have better improvement in your work. 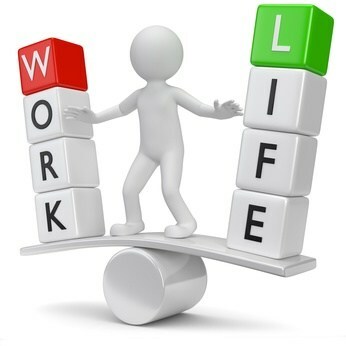 Everyone can have their own work-life balance just which standard you want to have? Try to not think of work-life balance before you success in your work where it will limit your mindset and you will just think about short-term and not long-term.